These concrete garden benches make a bold statement with their simple lines and robust appearance. Steel-reinforced concrete construction provides the strength and durability to last in heavy traffic areas for years of usage. These concrete benches are an excellent choice for commercial as well as residential use. Sealed with water repellent sealer for protection and durability. 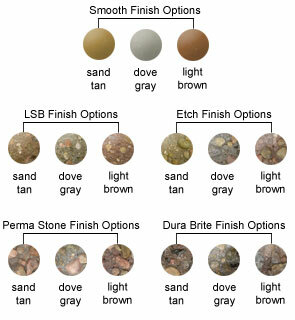 Choose from the many different colors and finish options shown to match your facility. Bench seats are available in the Smooth finish color options while the bench base or legs are available in the Light Sand Blasted (LSB), Exposed Aggregate (Etch), Perma Stone, and Dura Brite finish options as shown. Bench models with an "L" in the model number feature two durable concrete legs, and models without the "L".